It is an honor to formally recognize the extraordinary achievements of those selected for the 2015 National Roadway Safety Awards. The individuals, groups, and agencies participating in this program have shown a commitment to eliminating fatalities and serious injuries on the nation's roadways. 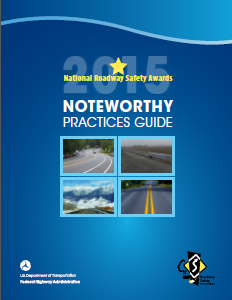 This guidebook showcases each of the 2015 National Roadway Safety Award winners. Awards were conferred in two categories: Infrastructure and Operational Improvements and Program Planning, Development, and Evaluation. Each entry was carefully evaluated for innovation, effectiveness, and efficient use of resources. This year's recipients have reduced lane departure, wet weather-related, speeding-related, and wrong-way fatalities and crashes; improved lighting for pedestrians at intersections and transit stops; implemented analysis methods and software to more fully incorporate safety in departmental functions; implemented programs to efficiently apply limited funding toward the high-priority needs; and improved safety and mobility for aging populations. The Federal Highway Administration and the Roadway Safety Foundation have jointly sponsored this national awards program since 1998. Our enduring partnership will continue to foster innovative and life-saving measures to help make our Nation's roadways safer. 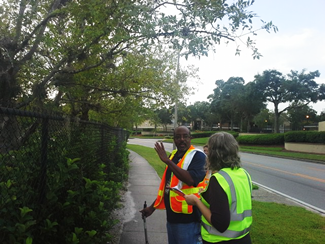 This program provides the opportunity to recognize and share innovative roadway safety practices. Congratulations to all of the 2015 National Roadway Safety Awards winners! THE SAFETY CONCERN Fatal crashes related to lane departure. 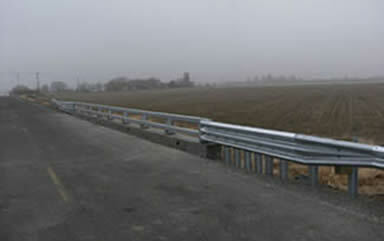 THE SOLUTION Systemic application of centerline and shoulder rumble strips for high speed, non-freeway roadways. THE RESULT Significant reductions in fatal crashes. If a driver is able to keep a vehicle within its lane of travel, the chances of a crash occurring decrease dramatically. In fact, between 2004 and 2007, the Michigan DOT (MDOT) determined that lane departures had contributed to nearly half of their fatal crashes. A problem of that magnitude required a solution of similar scale. After careful evaluation, MDOT embarked on an unprecedented, systemic program of rumble strip installation. 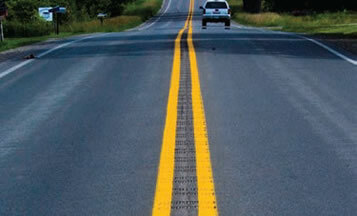 Rumble strips are regularly-spaced grooves milled into the roadway to provide both vibratory and audible alerts to drivers if they begin to stray from their lanes. 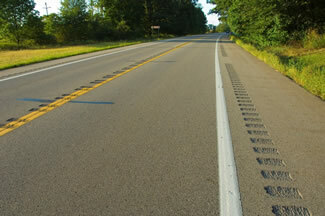 Between 2008 and 2010, MDOT installed centerline rumble strips on all high-speed, rural, non-freeway highways. When paved shoulders at least 6 feet wide were present, they installed shoulder rumble strips as well. By adding the milling to their regular annual striping contracts, the department streamlined the construction process, saving both time and money. In some cases, the overall cost amounted to only pennies per foot, well under $1,000 per mile. An undertaking of this scale also gave MDOT a unique opportunity to study the performance of centerline rumble strips. For each year of installation, MDOT compared crash data from the three years prior to rumble strip installation with crash data from the three years after installation. For example, for rumble strips installed in 2010, 2007-2009 was the "before" period and 2011-2013 was the "after" period. The study showed that the effort reduced total target crashes (head-on, sideswipe opposite and run-off-the-road left) by 47 percent and fatal crashes by 51 percent. These reductions yielded benefit-cost ratios as high as 58 to 1. The success of Michigan's centerline rumble strip installation on existing roads has been a catalyst for requiring their use on new construction projects. The State expects to continue to realize safety benefits from this effort well into the future. THE SAFETY CONCERN High rates of wet-weather roadway departure crashes on the Interstate. THE SOLUTION Treatment of pavement with ultra-thin bonded wearing course. THE RESULT Significant decreases in roadway departure crashes related to wet conditions. Wet conditions often increase incidence of roadway departure, the leading contributor to fatal and serious injury crashes. This trend was clear in the 70 crashes that occurred over 4 years on a 4-mile segment of Arkansas' Interstate 30. Since two different strategic safety plans within the Highway and Transportation Department (AHTD) emphasized reducing roadway departure crashes, the issue had to be managed. Moreover, it had to be addressed with cost-effective strategies and countermeasures. In keeping with this goal, the department identified several Interstate locations that displayed higher-than-normal percentages of wet-weather crashes. 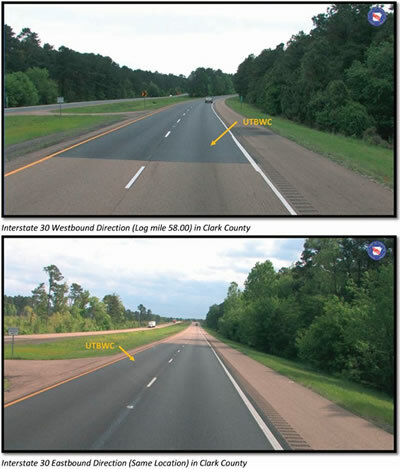 AHTD was able to address a number of these locations by installing a 4-mile ultra-thin bonded wearing course (UTBWC). UTBWC is a pavement treatment that relies on the size, shape, and roughness of its aggregate to increase tire friction and channel water away from the pavement. Within 4 years, the improved pavement texture provided by the UTBWC lowered wet-weather crashes from 70 to 5, a 93 percent reduction. The project also was cost-effective, resulting in a benefit-cost ratio of nearly 3 to 1. 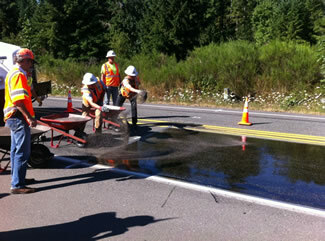 The pavement treatment provided the additional benefits of preserving the existing pavement and improving user comfort. The crash-reduction potential of Arkansas's Interstate pavement surface treatment was so dramatic that AHTD leadership quickly authorized the program to continue. Five additional Interstate locations were treated with UTBWC in 2013, and more locations will be identified in the future. THE SAFETY CONCERN Collecting crucial data on lighting intensity was labor intensive, expensive, and dangerous. THE SOLUTION Deployment of an Advanced Lighting Measurement System. THE RESULT Significantly higher quantities of data collected using this safer, more cost-effective methodology. This is true even though nighttime traffic volumes are only a fraction of those present during the day. Intoxication and fatigue are more prevalent during those hours, but it is the drivers' decreased ability to clearly perceive their environment that makes nighttime driving inherently more hazardous. Highway engineers battle this condition by providing roadway lighting in critical areas. But the provision of lighting alone often is not enough. Lighting intensity can be too low to illuminate the roadway sufficiently, or grime and vegetation can eventually dim the source. The Florida Department of Transportation (FDOT) approaches the nighttime crash problem in a data-driven manner. Workers measure the lighting intensities along the corridor and then superimpose them on a map of crashes to reveal the areas where high crash rates and low lighting coincide. However this data collection is generally slow, hazardous, and expensive. Traditional methods involve several workers, on foot in various locations on the dark roadway, reading handheld meters. The Advanced Lighting Measurement System (ALMS) has revolutionized this process. 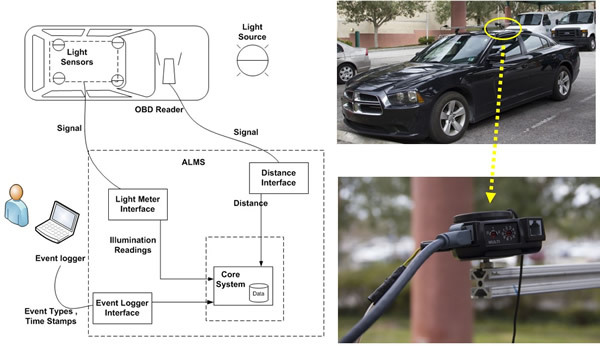 The ALMS uses a vehicle-mounted sensor that collects data in real-time as the operator travels the corridor along with the normal traffic stream. The data can be downloaded and analyzed in the safety of an office. Data collection rates using ALMS are 300 times greater than traditional methods. This efficiency has allowed Florida to collect over 250 miles of data in a few months—rather than a few years—and realize savings in excess of $1.2 million dollars. The data have been used to address lighting in critical areas such as intersections and transit stops where pedestrians are particularly vulnerable. FDOT also has identified corridor lighting deficiencies and included their remedies in the scope of projects under development. THE SAFETY CONCERN Severe crashes due to wrong-way driving. THE SOLUTION Installation of wrong-way detection and warning on at-risk roads. THE RESULT Dramatic decreases in wrong-way crash fatalities and serious injuries. Most freeway drivers do not expect to see a vehicle traveling toward them head-on. Such alarming statistics are the reason that the Texas Department of Transportation (TxDOT)San Antonio TransGuide office confronted the issue in 2012. TransGuide is an ITS partnership among TxDOT, the City of San Antonio, and VIA Metropolitan Transport. With the assistance of the Texas A&M Transportation Institute (TTI), the group identified a 15-mile segment of US 281 as the most problematic in terms of wrong-way operation. The countermeasures for this segment were twofold: enhanced warnings to both the errant driver and the rest of the traffic stream, and real-time alerts to law enforcement. 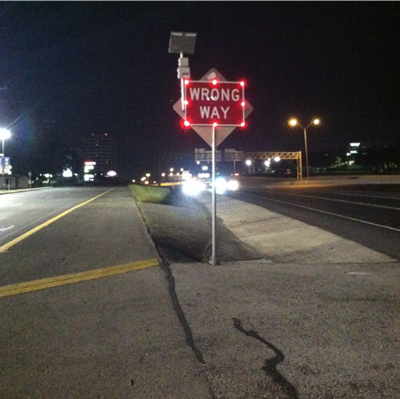 Illuminated "Wrong Way" signs provide the first warning to drivers errantly entering the oncoming traffic stream. But their effectiveness with intoxicated or extremely drowsy drivers is uncertain. For this reason, radar-based sensors detect the direction, speed, and location of the errant vehicle and relay the information to TransGuide operators who coordinate with law enforcement in real time. This gives officers a chance to arrive on the scene and apprehend the driver before a crash can occur. The TransGuide operators activate changeable message signs that caution drivers in the normal traffic stream that a wrong-way driver may be in the area. Since the introduction of this technology, the occurrence of wrong-way events on the US 281 corridor has decreased by 31 percent. These remarkable results have generated a 13.1 to 1 benefit-cost ratio, making this a promising safety enhancement for additional locations. THE SAFETY CONCERN Speeding and crashes on a 4-lane undivided road. THE SOLUTION Implementation of a Road Diet. THE RESULT Safer operating speeds and sharp decreases in crashes. Four-lane undivided highways often have relatively high crash rates as traffic volumes increase and as the inside lane is shared by higher speed through traffic and left-turning vehicles. One option for addressing this safety concern is a "Road Diet." A road diet is the practice of reducing the number of lanes from a wide roadway to increase its safety and usability. 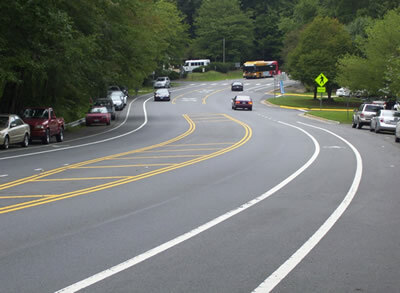 In the case of Lawyers Road in Reston, VA, four through lanes were reduced to two through lanes and a center turn lane was added. The surplus width was converted to bicycle lanes. Prior to the project, this 2-mile segment carried about 10,000 vehicles per day, was prone to excessive speeding, and averaged 16 crashes per year. As part of an enormous outreach effort, VDOT engineers publicly forecast a post-Road Diet crash reduction of 20 percent. After the project's completion, crashes were found to have decreased 69 percent to only 5 per year. VDOT realized additional safety benefits in the operating speed of the facility. While the average running speed decreased by only 1 mile per hour after the road diet, the fastest traffic 5 miles per hour or more over the speed limit was all but eliminated. The road diet also enhanced bicycle safety through new dedicated bicycle lanes and a bicycle-actuated signal. The road diet consisted of little more than pavement markings, and the project was added to an existing resurfacing project. As a result, the cost to the State of Virginia was nearly nothing. While initial support for the road diet concept was mixed, the overwhelming success of the Lawyers Road project more than quelled concerns. A post-deployment survey conducted by VDOT revealed a 74 percent approval rate for the project. It is hardly surprising then, that when a similar neighboring road – Soapstone Drive – was slated for resurfacing, many Reston residents supported a similar treatment. The Soapstone Drive road diet also generated positive results. The road diet design has served VDOT well, and likely will remain in its toolbox for years to come. THE SAFETY CONCERN Need for more robust safety analysis. THE SOLUTION Development of safety performance functions and the software with which to use them to evaluate actual performance against a baseline. THE RESULT Increased ability to incorporate safety into more functions of the DOT. Roadway departures account for just over half of fatal crashes in the United States,3 but in Montana the numbers are particularly dramatic. The roadway departure study focused on the development of safety performance functions (SPF). An SPF is a baseline for safety performance, describing how a specific roadway should function at any given traffic volume. Once an SPF has been established, the actual safety performance of any segment of that roadway can be evaluated. MDT implemented the SIMS software to perform that very analysis. 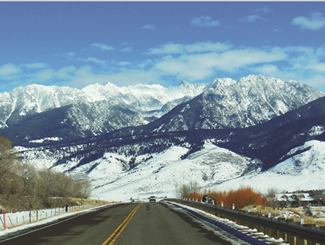 Using the newly-developed SPFs and other Highway Safety Manual methods, MDT staff employed the SIMS to screen Montana's rural on-system roadway network for specific areas of concern. Once those areas were identified, MDT staff could work to develop solutions. The software also enhanced data access for other users throughout the agency, provided easy querying capabilities, and stored a host of other roadway characteristics necessary to accurately analyze performance. With the development of these tools, MDT will be able to complete more in-depth safety reviews of design projects. The tool also may be used to increase safety within the planning, maintenance, and operations arenas. THE SAFETY CONCERN Most effective disbursement of HSIP funds to local agencies. THE SOLUTION Implementation of a County Safety Program. THE RESULT HSIP funding directed toward highest priority targets. For improvements to truly make an impact, targeted safety improvements must be deployed where data indicate they will do the most good. For instance, a single high-profile or catastrophic crash may not necessarily indicate a safety deficiency at a particular location. But a careful comparison of the safety performance of that location to similar locations statewide just might. This is what Washington State Department of Transportation (WSDOT) personnel had in mind in 2014 when they developed the County Safety Program. Under this program, counties were required to develop a data-driven local road safety plan before they could be eligible to apply for Highway Safety Improvement Program (HSIP) funding. WSDOT did not fund the development of the county plans, but it did provide the local agencies with training and a summary of data that prioritized crash types, roadway characteristics, and conditions in comparison to other counties. Nearly 80 percent of Washington's counties submitted safety plans and subsequently received over $26 million in project funding. By creating their own plans, counties became invested in the process. As a result, HSIP funding was directed high priority locations around the State. Given the initial success of the program, WSDOT is collecting feedback from its local partners to refine the process for future HSIP awards. WSDOT also is supporting the development of an analytical tool to streamline this process in the future. THE SAFETY CONCERN Most effective disbursement of limited HSIP funding. THE SOLUTION Development of Virginia-specific Safety Performance Functions. Where safety improvements are concerned, one size definitely does not fit all. The nature of crashes tends to be rather varied and somewhat unpredictable. But in 2013, engineers from the Virginia Department of Transportation (VDOT), started to overcome that hurdle by developing Safety Performance Functions (SPF) for highways in their State. An SPF is a mathematical model that provides the existing level of performance that can be expected for a given roadway segment. Since the SPF is tailored to a specific area, it is able to account for volume, length, and a host of other roadway characteristics. Once the expected level of performance has been established, it can be compared to the performance that is observed in real life. The difference between these two performance levels is known as the Potential for Safety Improvement (PSI). Locations with the greatest PSI are generally regarded as having the highest priority for highway safety improvements. Prioritization such as this provides a critical assurance that limited safety funding is not wasted on improving sites with no real safety problems. Every year VDOT personnel screen and analyze nearly all of the 58,430 miles of highway on their system. VDOT uses the results of this screening to generate lists and maps of both the top 100 most safety-critical intersections and top 100 miles of roadway segments in each VDOT district area. VDOT district staff review the lists to determine the appropriate countermeasures to deploy to improve safety. Once these improvements are ranked and the highest priorities funded and built, VDOT conducts a 3-year before-and-after crash study to gage the effectiveness of the treatments. This data-driven process greatly improves VDOT's ability to deploy safety projects in locations where they will do the most good. THE SAFETY CONCERN Elevated crash rates on local roadways and intersections. THE SOLUTION Launch of a small-area Road Safety Audit. THE RESULT Identification and remediation of safety concerns. An agency does not have to look very far to find an opportunity to improve safety; sometimes it is right in its back yard. At least that is what engineers in the Orange County, Florida Public Works Department discovered in 2014. They noticed that a cluster of intersections and roadways exhibited high crash rates and decided to investigate the problem more deeply. This effort revealed that several locations in the vicinity of Texas Avenue and Americana Boulevard were of concern to both the county and the State. The Texas-Americana neighborhood is mostly residential with a fairly diverse demographic. Many of the residents rely upon bicycle-pedestrian facilities or transit services for their transportation needs. Among these are the 800 or so students who walk or ride to Palmetto Elementary School each day. A comprehensive multi-modal Road Safety Audit revealed that besides several concerns with infrastructure, behavioral issues were evident. The interagency auditors noticed equally unsafe conduct on the parts of drivers, bicyclists, and pedestrians. A simple remedy for this concern was a bicycle helmet promotion and giveaway seminar. During this event, children were fitted for and received helmets – free of charge – while adults were given cards printed with bicycle-pedestrian safety tips. The Orange County Public Works Department also held a community forum to present the findings of the safety audit to the public. This meeting provided an additional opportunity to answer questions and teach safety. The Orange County Public Works Department classified infrastructure needs according to maintenance activities and new construction needs. The maintenance activities such as sidewalk repairs and vegetation management could be implemented quickly while the larger improvements were prioritized for future construction. The success of the Orange County effort demonstrates that effective safety improvements can be accomplished locally and without a great deal of expense. THE SAFETY CONCERN Increasing rates of aging-driver crashes. THE SOLUTION Creation of the Safe Mobility for Life Coalition. THE RESULT Safer mobility for the aging population. As the aging population continues to increase, individuals may experience challenges such as declining vision, decreased flexibility and psychomotor performance, and changes in perceptual and cognitive performance. This may be particularly evident in Florida where 18.2 percent of the population is over age 65. This figure is at least 3 percent higher than that of the nation as a whole,4 and is only expected to increase. Not only are Floridians living longer, but they also are continuing to drive longer than any generation before them. The safety and mobility concerns associated with this age group have to be managed while still honoring its transportation needs and desires. 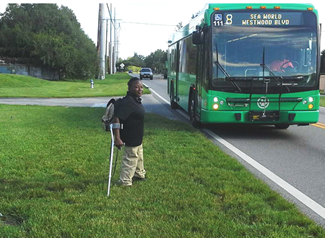 In 2004, the Florida Department of Transportation (FDOT) developed an aging road user program that eventually grew into the Safe Mobility for Life Coalition (SMFLC). 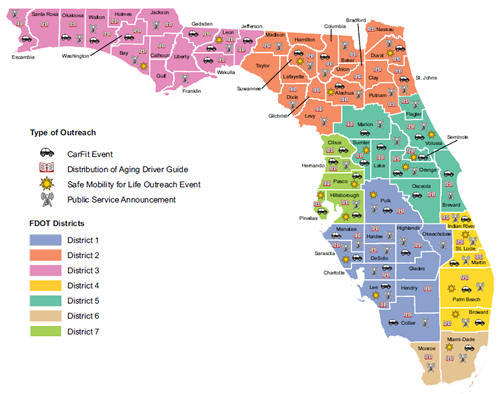 This coalition identifies both engineering and behavioral solutions to improve the safety, access, and mobility for Florida's aging population. Engineering solutions center on infrastructure modifications that compensate for the natural changes that occur as people age. Features such as increased visibility, pedestrian-friendly intersections, and advance signing all can enhance the safe driving experience for older adults. On the behavioral side, the coalition focuses on human factors studies, education, and training to benefit all stakeholders, including older adults, engineers, planners, health care providers, law enforcement, and families/caregivers. Ten key emphasis areas – ranging in scope from advocacy to helping seniors transition from driving – guide the work of the coalition, and several metrics are in place to measure its success. The work of the coalition preserves the value and dignity of Florida's aging demographic while protecting the safety of all its drivers. We are especially grateful to the esteemed panel of Blue Ribbon Judges who have supported this program. Their contributions of expertise, time, talent and vision have been extremely important in ensuring the continued success of this program. The FHWA Office of Safety's mission is to significantly reduce highway fatalities and serious injuries by making our roads safer through a data-driven, systematic approach to putting safety first when applying engineering, education, enforcement, and emergency medical services. Focus areas include: Comprehensive Strategic Planning, Roadway Departure, Intersections, Pedestrians and Speed Management. The Roadway Safety Foundation is a 501(c)(3) nonprofit charitable and educational organization solely dedicated to reducing the frequency and severity of motor vehicle crashes by improving the safety of America's roadways. To this end, the RSF focuses on improving the physical characteristics of roadways, such as design and engineering, operating conditions, removal of roadside hazards, and effective use of safety features.